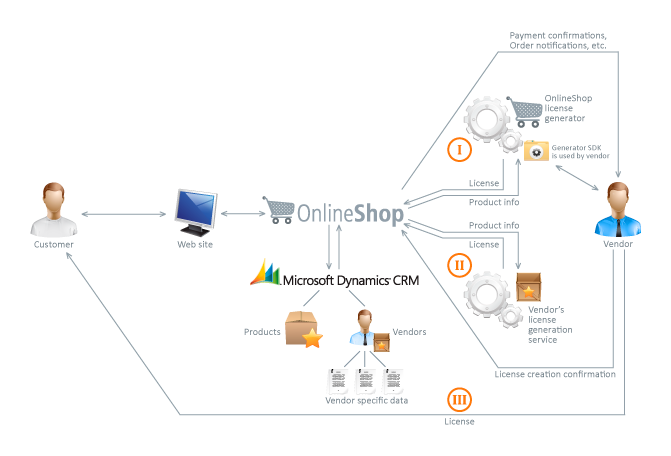 OnlineShop is an e-commerce module, integrated with Microsoft Dynamics CRM, built into your web site. It is especially convenient for software vendors, since software has different versions, editions and is built for different platforms. Customer registration, private account and order history. Our web store implementation OnlineShop also supports a partner program selling model; when the products are distributed through a community of partners, each partner has its own list of accounts. While OnlineShop's business logic currently fits software vendors and resellers best, WaveAccess will be happy to customize the CRM OnlineShop to make it a perfect fit for your business. Go to order confirmation and buy what he/she has in the cart. The fastest way – product catalog. A place where all the products are available in the filtered grid and the user can add several products (SKUs) into the cart simultaneously. The order wizard provides a straight forward way to order just what is required for users who are not familiar with your products. But, there will be another way to order products using the Products catalog screen that lists all the products (SKUs) that can be sold and allows the user to select any products immediately on this screen. Filters are intended to help easily find the products, their required versions, editions and platforms. Shopping cart is a page where your customer can review and update product items previously added using wizard or catalog. This page is the place where customers are able to proceed to checkout using PayPal. After successful payments, he/she is directed to the Order Finish page and receives emails from both PayPal and your site about the successful transaction as well as software download emails. OnlineShop uses PayPal to process online payment via credit cards, bank account or PayPal funds. After your customer fills his/her shopping cart, and clicks the “Buy” button, OnlineShop sets the status of Order CRM entity to “Pending”, and a request with order information is sent to PayPal. The customer is then redirected to the PayPal site to complete payment. The customer should log into his/her PayPal account or select "other payment method" (credit card etc). After completing the payment, customers may return to the OnlineShop. After the transaction is completed, PayPal sends confirmation to the OnlineShop which checks if the payment is correct and creates a CRM Invoice entity for the corresponding Order. The invoice status is set to “Paid”, and the Order status becomes “Complete”. If the payment fails, or if it's canceled, the Order status will be set to “Failed”. WaveAccess can integrate this web store for CRM with your preferred payment method. OnlineShop supports easy customer registration, sign in and log out procedures. Each customer Account is stored in CRM with its respective details, such as company name, contact person and address details. 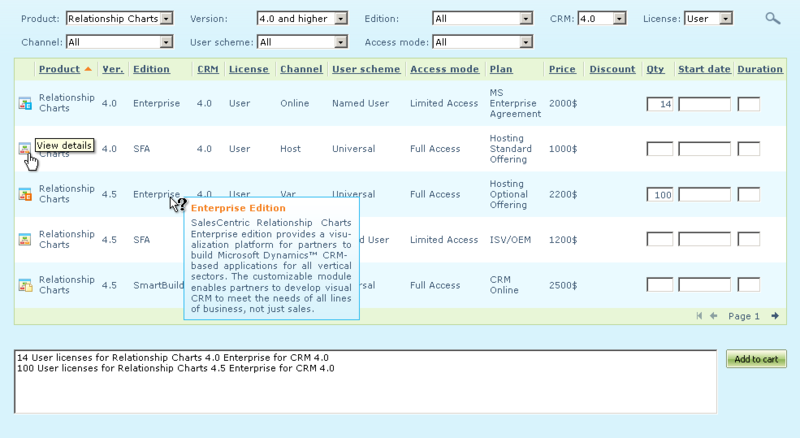 These details can be changed by the customer at any time and it's all stored in the CRM again. Order History is kept in the system for every customer. It can be easily filtered by Order Date and Order Number. For the customers that are your company's Partners, the list of clients is available. Partners can add and remove their clients’ Accounts, as well as edit their details.